Most of us easily recognize our New England countryside by the traditional white or brick Protestant churches that anchor the villages, their white spires often visible from a distance. Yet these days most New England communities are also home to Catholic churches, as well as smaller Protestant denominations that may not be housed in traditional churches. As for our mosques, temples, and other houses of workshop, it’s easy to miss them as we drive by. Not only are they often tucked in unexpected areas, away from the road, but we may not recognize their buildings as houses of worship. A lovely place to visit if you are in the Hillsdale area is the Korean Buddhist Won Dharma Center in Claverack, New York. Three miles west of the Taconic on State Route 23, we turned at an unobtrusive sign for the Won Dharma Center and drove half a mile up a private road. Reaching the parking lot, five architecturally-spare rectangular buildings of weathered natural wood and glass spread before us on the crest of a hill, with over four hundred acres of rolling pasture and woodlands on every side. 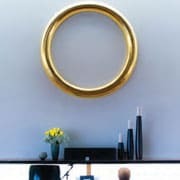 A large circle, Won Buddhism’s only religious symbol representing the quest for timelessness and enlightenment, decorates the front wall of the large airy meditation hall, whose vast windows look onto western hills. Most participants sit on pillows for meditation and Sunday Dharma services, and the heated floor made us long to take a yoga class. Two natural-wood buildings for retreat guests offer warm but spare accommodations in single, double, and dormitory-style rooms. There is an acupuncture center and an administration building with a cafeteria, as well as housing for the eleven ministers in residence. Although ten of the ministers are Korean, all services are conducted in English. Won Buddhism, a modern and simplified form of Buddhism, was founded in Korea in 1916. Directed to those who live in a secular world, there are now over twenty Won Buddhism centers throughout the US, including a Won Institute outside Philadelphia offering graduate programs in acupuncture studies, applied meditation studies, Chinese medicine, Won Buddhist studies, Buddhist pastoral care, and contemplative psychotherapy. In addition to individual and group retreats directed to helping guests quiet their minds “one breath at a time,” Claverack’s Won Dharma Center offers: Meditation – daily: 6-7am, Sunday: 10-11:30am, Wednesday: 7-8:30pm. Yoga – Thursday: 6-7:15pm, Friday: 10-11:15am. Walks – Anytime, dawn to dusk, on the Center trails. Shoes are removed inside all buildings. For more information, visit www.wondharmacenter.org or email them at info@wondharmacenter.org. Turning off Route 41 north of Salisbury, Twin Lakes is a narrow wooded road of sparsely set houses. Taking a turn, we came upon a pretty white wood church with green trim. All Saints of America, an Orthodox Christian Church, sits on a spit of grass, with scarce room for parking, though as the congregation filled cars parked wherever they could, and there was a lively and welcoming atmosphere. The Orthodox Church was brought to America by Russians who came across the Baring Strait to Alaska in 1700s. Today, most Eastern Orthodox Christians in America are of Russia, Greek, Eastern European, and Arab descent, though a growing minority are converts of Western European, African, and Latin American backgrounds. At All Saints of America, where the congregation is multi-ethnic, we were told that “scripture is read in Russian, Greek, and Arabic, as well as English at Easter to proclaim to the whole world the good news of Christ’s Resurrection.. The architecture and iconography of Orthodox churches are deeply symbolic. The inside of All Saints is divided into three parts, following Orthodox tradition: we entered the Narthex, which represents the outside world. Although traditionally all visitors not baptized or not Orthodox are required to stand there, we were welcomed into the Nave. The Nave is where heaven and earth meet, in Christ. Thus a huge Icon of Christ in the center on the ceiling represents the unity of all in Christ, both in this world and in the next world. Passing into the Nave, the main body of the church, we stood throughout most of the service. Traditional Orthodox churches have no seats or pews; instead, stacidia, arm rests high enough to be used for support while standing, are usually found along the walls. However, since All Saints was formerly a Catholic church, only some of the pews have been removed, allowing congregants, who find standing difficult, to sit. The iconostasis is a screen between the Nave and the Sanctuary covered with icons. As is traditional, the iconostasis at All Saints has three doors, one in the middle called the Royal Doors, which are used only by the arch priest and closed at times during the service, and one on either side, called the Deacons’ Doors or Angel Doors, as they often have the Archangels Michael and Gabriel depicted on them and are used by deacons and servers to enter the sanctuary. The area behind the iconostasis is the Sanctuary. Within this area is the holy table or throne; the Apse containing the high place at the center back with a throne for the bishop and the seats for the priests on either side. We visited All Saints on April 9th, Memorial Saturday for the 5pm Saturday Vesper Service, which was the Panikhida, a service “for those fallen asleep.” As we entered, we were allowed to add the names of our dear ones who had died to the list compiled by congregants. Chanting by the arch-priest, Father John Kreta, alternated with Gregorian-style music sung by four voices, and the list of those departed was chanted by the arch-priest on several occasions, creating a stirring service. Driving east from Amenia’s modest business section on Route 341, you can easily pass the tiny brick synagogue wedged between a Dollar Store and a modest private house. A pocket-sized garden leads to the front door to Congregation Beth David, which was built in 1929 by Russian Jewish immigrants. Having tried dairy farming in the stony hills above Sharon, Connecticut, they were beginning to run the small hotels and businesses that would turn Amenia into a bustling Jewish resort until the end of World War II. Though Beth David began as an Orthodox congregation, with services offered in Hebrew and Yiddish, these days the Reform services are held in English and Hebrew, and the community is divided among weekenders from New York City, Jewish students attending area boarding schools, and full-time residents, many of whom are retirees. Several non-Jews are also regular congregants. Inside, the sanctuary is intimate, light and airy. The alter leads to an ark covered by navy blue velvet embroidered in gold, which holds several Torah scrolls. (The Torah, consisting of the five books of Moses, is referred to as “the Old Testament” by Christians). The names of those who paid for the building are memorialized on the sanctuary’s stained-glass windows and sixty-six upholstered seats, many of them still recognizable, as their descendents still reside in nearby New York and Connecticut. Behind the sanctuary lie a kitchen and an ample community room, which holds the Oneg Shabbat (an informal coffee hour to celebrate the Sabbath), study groups, holiday festivities, and a range of other activities. Rabbi Jon Haddon, who trained as a cantor before becoming a rabbi, has long been a strong voice for inter-faith understanding. With his guitar at the ready, Rabbi Hadden enlivens his bi-weekly services with solo and congregant singing of old and new melodies. For more information and schedule for services, Hebrew classes, and other events, visit congbethdavid.org, or email info@congbethdavid.org. The understated turnoff to the Shrine of Lourdes is barely half a mile beyond Litchfield’s main intersection at 50 Montford Road. This expansive park-like Catholic shrine, a ministry of the Montfort Missionaries, is an outdoor experience, so wear sturdy shoes and choose a nice day. The stone Grotto of Lourdes is modeled after the place in France where, in 1858, a young peasant girl, Bernadette Soubirous, experienced the Mother of God appearing to her with a message of hope and encouragement. Like Lourdes in France, over the years, Lourdes in Litchfield has become a place where each year thousands come for pilgrimage and prayer. In addition to the grotto chapel, where mass is regularly held during the pilgrimage season, between May and October, the shrine offers a long up-hill walk along the Stations of the Cross, a gift shop, café, picnic area, and restrooms. Set off slightly at the top of its own hill, Lourdes in Litchfield also includes a lovely stone building that houses both the priests’ residence and a retreat center with rooms for guests. Mass is held regularly during the winter months and in inclement weather in the little chapel on the first floor. Although we explored the lovely grounds comfortably on our own, those wanting to make a formal pilgrimage as a family or with a group to Lourdes in Litchfield (the pilgrimage usually runs from 10:30am-4:00pm), should contact the Shrine Office (860) 567-1041 or Lourdesshrinect@gmail.com at least one month in advance. For a schedule of mass and other services and events, as well as general information, visit www.shrinect.org. Traveling south on Route 63, shortly after White Flower Farms, turn off onto Route 109, or East Street. Coming upon the Wat Lao Buddha Ariyamettaram Temple at 140 East Street, we glimpsed a dazzling pagoda through the leafing trees. Though located in conservative Morris, the well-manicured temple complex comprised of pagodas, meditation halls, and even a monastery housing several resident monks, is built in the Laotian style, richly carved and painted in gold and reds, that made us feel we’d been transported to Southeast Asia. Laotians, like Cambodians, Vietnamese, and other Southeast Asians, are Theravada Buddhists and rely on the teachings of the Pali Canon, a collection of the oldest recorded Buddhist texts. But their Buddhism also includes a rich diversity of traditions and practices that have developed over a long history of interactions with other cultures and communities. The Lao Buddha Ariyamettaram Temple was built in 2002 by Laotian Buddhist immigrants, who come to worship from Danbury, Torrington, and other towns of central Connecticut, as well as New Jersey and southern Massachusetts. Displaced when the US conducted its secret air war on Laos as a part of strategy against communist revolutions in Laos, Vietnam, and Cambodia in the 1960s and 1970s (Laos holds distinction as the most heavily bombed country in world), the Laotian-Americans we talked to had spent several years in refugee camps in Thailand before being admitted to the US as refugees. Nevertheless, they speak with gratitude for the lives they have managed to rebuild in America and are proud of the educational and professional accomplishments of their children. A plaque in the dining area of their meditation hall commemorates the Temple’s active help in conducting the 2010 census of Laotian-Americans. There is no official website for this wonderful addition to Connecticut’s houses of worship. While the temple complex is open to everyone, please remember to take off your shoes before entering any of the meditation halls. Feet should never be pointed toward a Buddha image, member of the clergy, or your elders. You can call the temple at (860) 567-5030. Having explored these local national treasures, I suspect that there may be many more in our area still to be uncovered. If you know of other houses of worship that deserve to be recognized, please contact me, Carol Ascher, at Main Street.